Halfpipe champion snowboarder Shaun White, throws his board and screams in excitement after seeing his score of 97.75 leading him to his third Olympic gold medal, Feb. 14 at Phoenix Snow Park. White broke into tears and hugged his friends and family before the venue celebration. Two time Olympic champion, halfpipe snowboarder Shaun White, reaches for his second jump at Phoenix Snow Park, PyeongChang, Feb. 13, for his second run scoring a 98.50, leading his way to the halfpipe finals. White will compete tomorrow against 11 other snowboarders to hold his position, in hopes to win his third Olympic gold medal. Ladies’ USA long track speed skaters gathered at Gangneung Oval, Feb. 12, to compete for Olympic gold in the 1500 meters long track speed skate. From the Netherlands, Ireen Wust brings home the gold medal with a time of 1:54.35 making her the most decorated speed skaters in the world. The first U.S. gold medal won by snowboard slopestyle 17-year-old Red Gerard, Feb. 11 at Phoenix Snow Park holds up an American flag during the medaling ceremony. Ladies slopestyle snowboarding took place this afternoon, Feb. 12 at Phoenix Snow Park at the PyeongChang Winter Olympics in South Korea. Jamie Anderson brought home gold for USA with an 83 points for her run in extreme wind and cold, making the obstacle course difficult. Back-to-back Olympic champion, France’s Pierre Vaultier, roars in excitement after securing his gold title in Men’s Snowboard Cross, Feb. 15, Phoenix Snow Park. 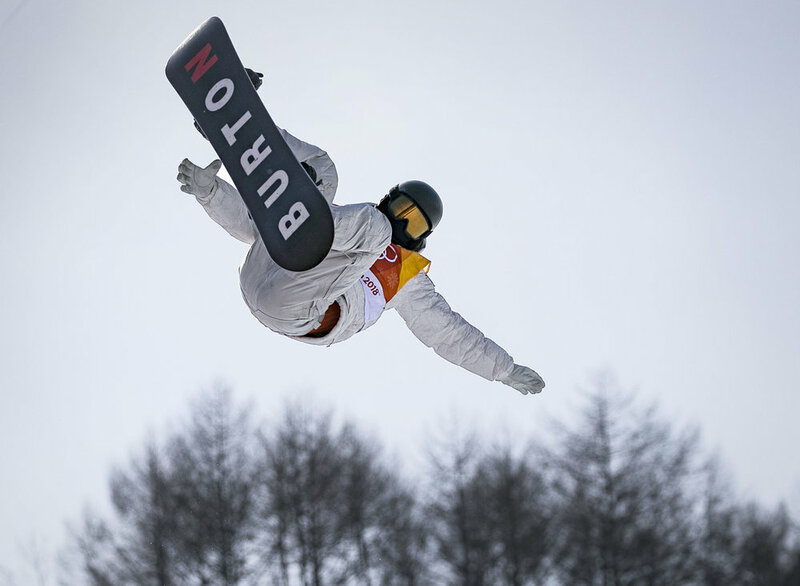 The motocross like mash up of six snowboarders and a mix of obstacle courses, the Olympic event Snowboard Cross features a little bit of everything and Vaultier continues to hold the gold. 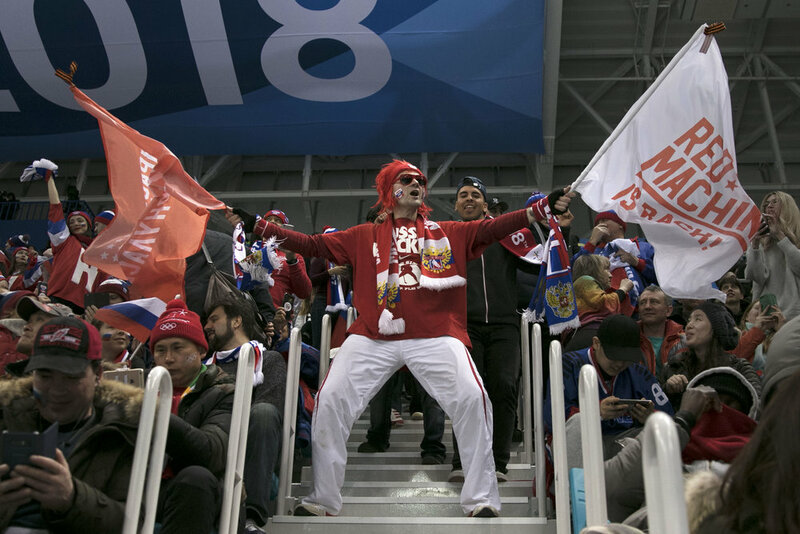 Olympic Athlete’s of Russia fans wildly cheer after after scoring in the second period against the U.S., Feb. 17, at Gangneung Hockey Centre. U.S. lost, 4-0 in a shut out against the Olympic Athlete’s of Russia. 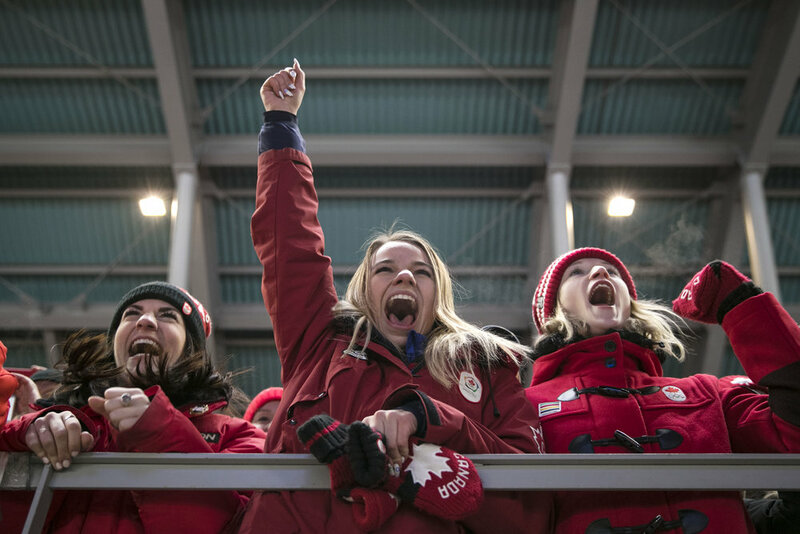 USA luger fan Alex Britcher from Baltimore, Maryland, cheers on his sister, Summer Britcher, as she competes in the luge team relay finals, Feb. 15, at Alpensia Sliding Centre, PyeongChang, South Korea. Alex, pauses to show off his patriotic face paint while yelling for his sister during her live TV interview after placing fourth in the finals. A ski jumper lands on the hill at PyeongChang Ski Jumping Center, South Korea, Feb. 16 during the 2018 Winter Games. A South Korea fan watches ski jumping from the sidelines, Feb. 16, at PyeongChang Ski Jumping Center, South Korea during the 2018 Winter Games. USA’s Ben Ferguson preforms a trick in the second heat of the of men’s halfpipe qualification, Feb. 13, at Phoenix Snow Park. Ferguson’s highest score from both runs was a 91.00, leaving him fourth going into final round. Olympic Athletes of Russia fans chant during a hockey game against USA, Feb. 17, Gangneung Hockey Centre. 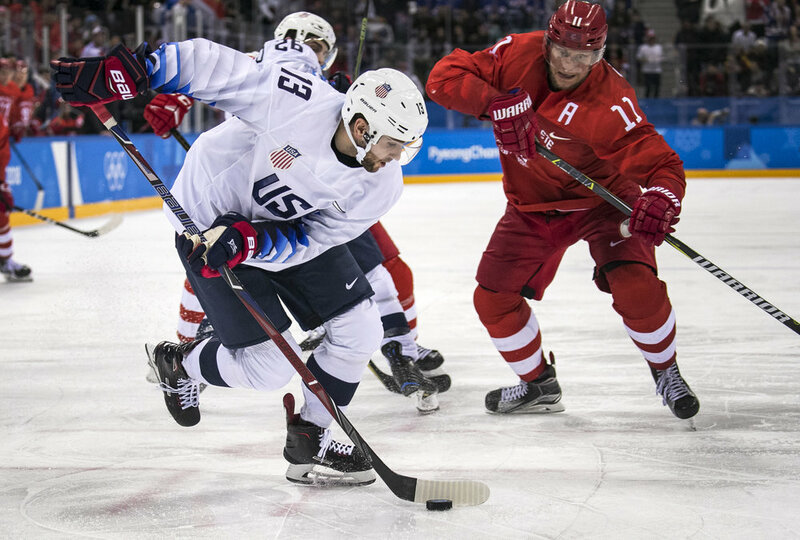 U.S. lost, 4-0 in a shut out against the Olympic Athlete’s of Russia. 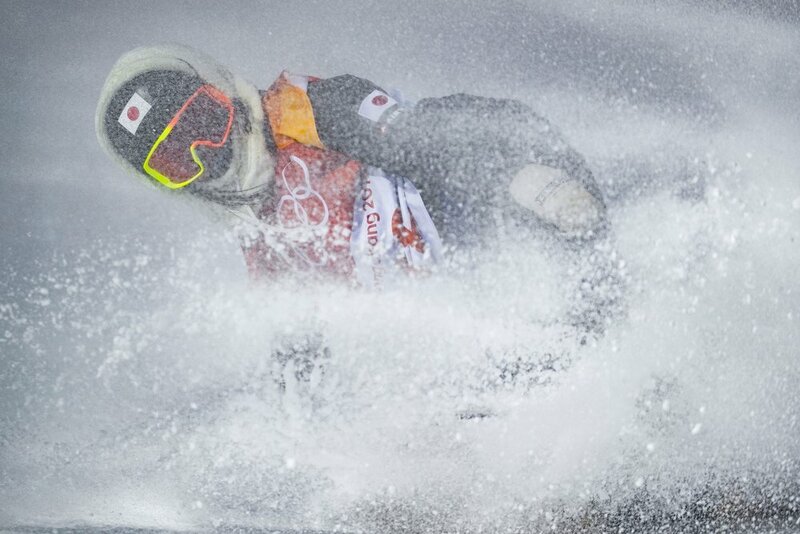 Canada’s relay team luger Alex Gough, searches for the target as she slides around the final corner, Feb. 15 at Alpensia Sliding Centre, PyeongChang, South Korea. Canada’s relay team of Alex Gough, Sam Edney, Tristan Walker, and Justin Snith won sliver with a final time of 2:24.872, all the way down to one hundredth of a second made the difference between, first and second place. 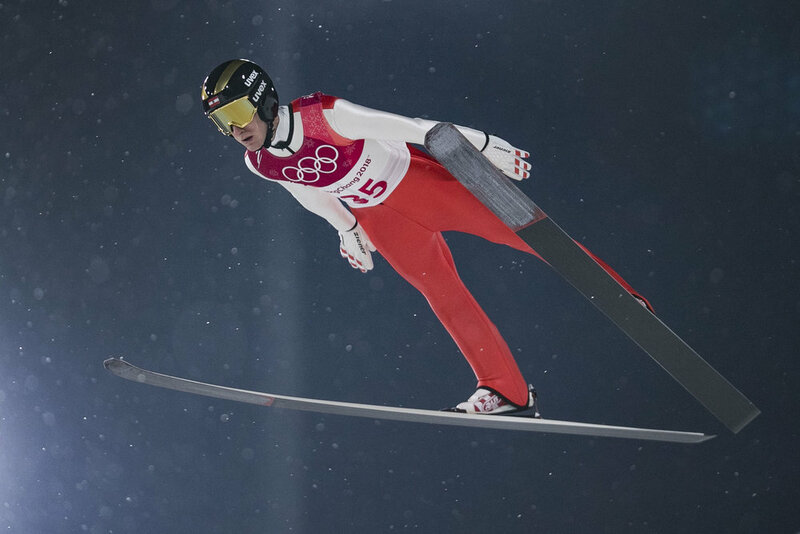 A ski jumper soars through the air searching to land on the hill at PyeongChang Ski Jumping Center, South Korea, Feb. 16 during the 2018 Winter Games. Halfpipe champion snowboarder Shaun White, smiles and cheers with his family and friends in the middle of the halfpipe after winning his third Olympic gold medal in the Men’s snowboarding halfpipe finals, Feb. 14, at Phoenix Snow Park. Athlete’s gathered to compete in motocross like mash up of six snowboarders and a mix of obstacle courses, the Olympic event Snowboard Cross, Feb. 15, at Phoenix Snow Park. First round of men’s halfpipe snowboarding took place this afternoon, Feb. 13, at Phoenix Snow Park. Only 12 riders moved on to finals and standing in first place is Shaun White with a 98.50. 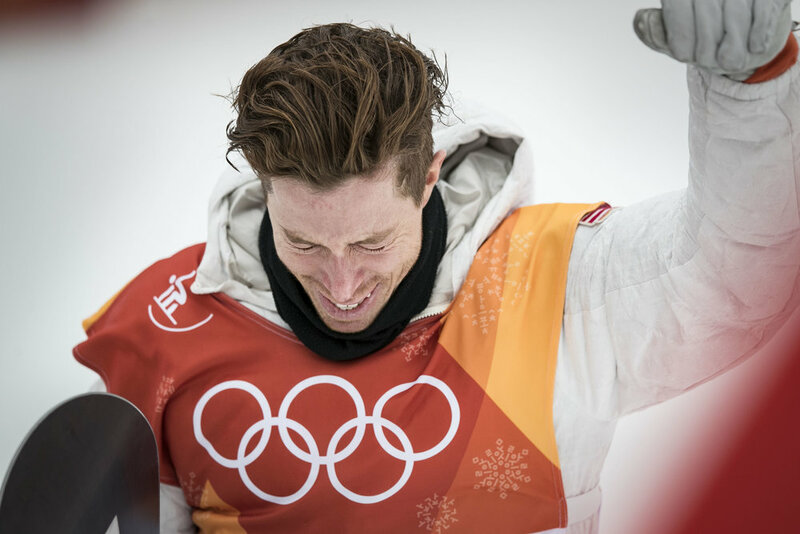 Halfpipe champion snowboarder Shaun White, cries tears of joy after seeing his score of 97.75 leading him to his third Olympic gold medal, Feb. 14 at Phoenix Snow Park. White broke into tears and hugged his friends and family before the venue celebration.